When I grew up in Lewiston in the 1970s, people believed that the then-new lower Snake River waterway would be the economic engine for our town's future. The lower Snake dams, which made Lewiston a seaport 400 miles inland, would be our route to prosperity. Today, I still live in Lewiston and own a business. I worry about our town's continued struggle to jumpstart its stagnant economy. It is clear to me, and to growing numbers of my neighbors, that the lower Snake River waterway has not brought the economic prosperity dam boosters promised us decades ago. And so our town must think anew about our economic future. Freight shipped by barge on the lower Snake River has declined almost 50 percent in the last decade, and not just since the recession that began in 2008. 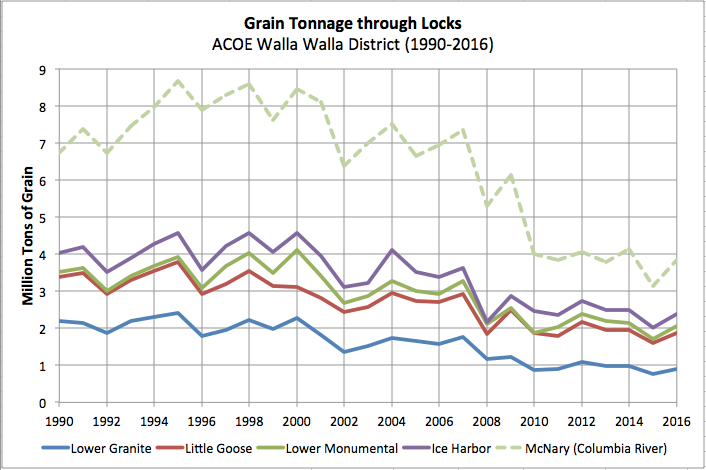 The lower Snake now carries just one-tenth of 1 percent of ton-miles on the Army Corps of Engineers' national waterway system. At a time when Army Corps budgets are dropping, it's not hard to see that limited taxpayer funds will go to the Mississippi and Columbia, not the Snake. If the Army Corps dredges the Snake navigation channel next winter, as it plans to, the taxpayer subsidy will be $11,000 to $18,000 for each barge leaving the Port of Lewiston. The Army Corps just released a $16 million environmental impact statement so it can get the legal authority to dredge the waterway next winter. In 1,500 pages, there is NO cost-benefit analysis of the dredging. It's not hard to see why; it's an economic loser that's impossible to paper over. The fact that the Corps will still need to raise the levees in Lewiston -- highly unpopular with the locals -- is buried deep in the document. There are calls from some elected leaders in region, most notably Gov. John Kitzhaber of Oregon, for a stakeholder process to resolve the long-standing conflict over how to restore Columbia-Snake River salmon and the impact of the lower Snake dams. NOAA Fisheries recently launched a "stakeholder assessment," a first step.